It contains two main sections that define important properties of the feature: General Information and Supported Environments. It functions as a quick reference on how to define, export and publish a feature by providing the Feature Content, Exporting and Publishing sections. These sections provide hyperlinks that, when clicked, navigate to other pages or invoke commands. An ID is mandatory and must comply with the specifications. A Name is the translatable presentation name of the feature. This field is required. A Vendor is the translatable name of the feature vendor. This field is optional. A Branding Plug-in stores branding information for primary features. 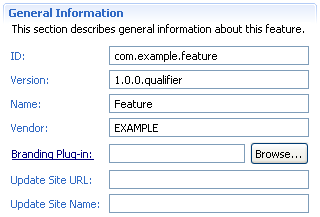 If not explicitly set, Eclipse will assume that the branding plug-in has the same identifier as the feature. The Update Site URL denotes a URL that is used by the installer when searching for feature updates. The Update Site Name is the human-readable label of the referenced update site. By default, your feature is treated as universally portable. 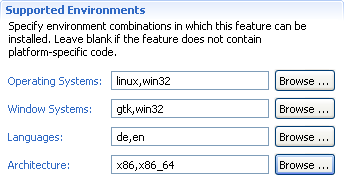 You can add constraints by providing supported Operating Systems, Window Systems, Languages and/or System Architectures. This information will be used to ensure that your feature is not installed or shown in the context that does not match these constraints.